For everybody who loves a pair of jeans, it’s natural to hem up with chain stitch. UES provide hemming service by vintage Union Special chain stitch machine. Union special is the name of sewing machine’s company established in 1881 in the United States. Most sewing machine’s company in Japan follow the technology and develop own skills. 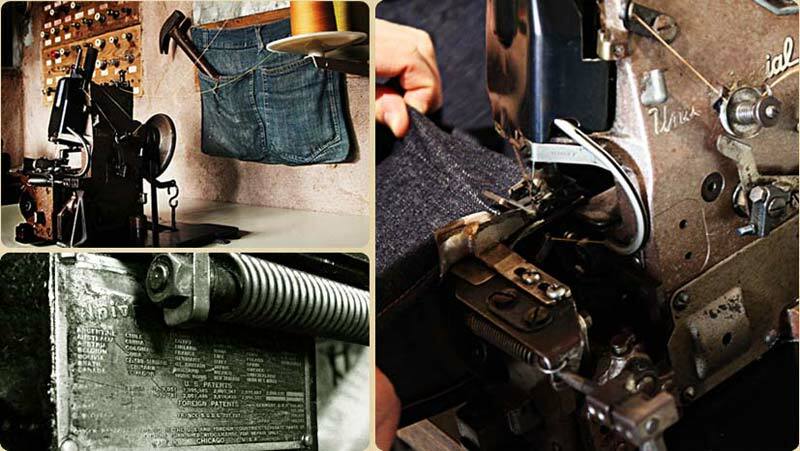 In fact Union special is the pioneer in the field, traditional and contributed to vintage jeans. Some old models are discontinued but even now they keep working at sewing plants. More than anything, Union Special is important for vintage sewing.There are many kinds of machines they sold ever. Model number 43200G is the specialized machine for hemming up of jeans. It has special form so images are different from standard sewing machine. Color fading of denim wear is attractive. It is amazing culture that color fading and change of texture by aging make them more and more brilliant. When the hem is stitched with the vintage Union Special 43200 chain stitch machine, jeans get contortions and puckers by special movement. It gives ropelike unevenness to clothing fabric. Finally it shows beautiful contrast. We have persistence to color fading, so we choose this sewing machine. This machine is used at not only the shops but also sewing plant to distribute the denims which are produced with the technique and cotton string around that time of vintage jeans.